Found in the Amazonian shamanic brew ayahuasca, DMT is one of the most mysterious molecules on the planet. Scientists, therapists, artists and lay people have all been attracted to its mystery. DMT is a psychoactive molecule and in this sense it is a drug. The title of this article is provocative for a very good reason. DMT is so strange and mysterious that it literally pushes the boundaries of the meaning of “drug”. In fact, many people who have consumed DMT say the experience transcends the boundaries of language itself. But first of all, what actually is DMT? It stands for dimethlytriptamine and it is a key ingredient in the Amazonian shamanic brew ayahuasca. When consumed, DMT fits snuggly into the most wide and important network in the human brain: the serotonin system. If drunk as part of the ayahuasca brew, the experience usually lasts for 4 to 8 hours. If smoked, it’s action is much shorter. It has a peak experience of 3 to 5 minutes and fully back to baseline, or ordinary reality, in 20 to 30 minutes. 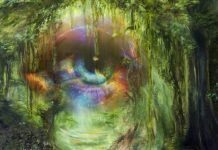 The DMT and ayahuasca experience are often called a journey or trip given the sensation of going on an epic expedition of the soul. The DMT trip includes the classic psychedelic effects of holographic rainbow patterns, time and space distortions and emotional intensities. But it usually includes an extra element. People who take DMT often report encountering and interacting with beings, spirits, extra-dimensional aliens or figures of the mind (*choose word that suits your belief system) . 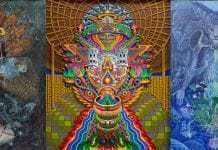 Artists and video animators have been busy trying to depict their inner DMT visions in mind-bending artworks. And wordsmiths have been scribing their visions en masse. You can read hundreds of descriptions of DMT experiences at Erowid. To study its safety and the medicinal and religious elements of DMT, Dr. Rick Strassman conducted research at the University of New Mexico in the 1990s. He gave 50+ people 600 doses of DMT over a period of several years. 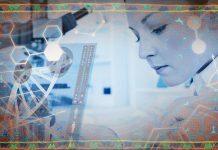 He discovered that the molecule is biologically very safe and not harmful to the body. Recent research has shown that DMT has anxiolytic or anti-anxiety effects on the brain and that it grows new brain cells in the hippocampus (which is an area of the brain important for memory and imagination). 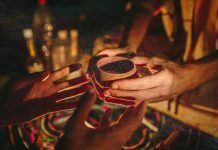 The ayahuasca brew (which contains DMT) has recently shown promise in helping heal treatment-resistant depression in a pioneering study in Brazil. 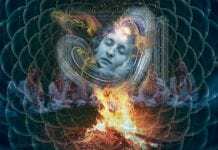 But with its soul expanding qualities, DMT can be extremely psychologically challenging. The possibility of a scary or “bad” trip is very real. There are many things that can influence the DMT experience, including your personal psychology and the setting or environment of the trip. But it’s important to know that not all people see “bad trips” as bad. 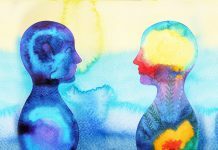 Many person on the psychedelic path relate to scary or challenging material in their visions as opportunities for letting-go or for learning about themselves and their emotional habits. 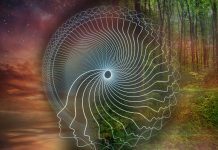 They prefer to talk about these experiences as not bad but challenging experiences that are insightful and essential parts of the psychedelic path (see videos on the ayahuasca path for more about this). This brings us back to the concept of druuuuuuuuugs. We should be careful with how we use language. The fact is that words are kind of like magical instruments, especially when it comes to something like DMT. Because, what you expect, believe and think will shape your DMT experience in very powerful ways. If you truly believe DMT is a toxic drug, then you will likely have terrifying visions. The experience is very prone to suggestibility. 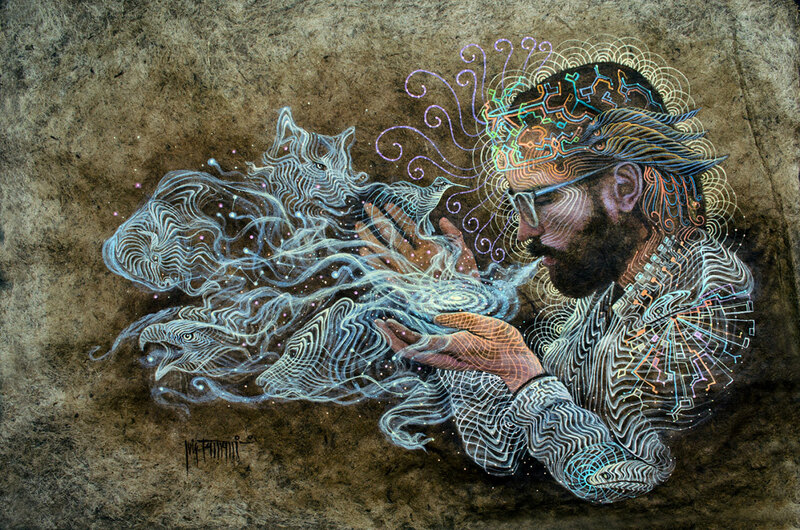 Artwork by the Peruvian artist Pablo Amaringo. 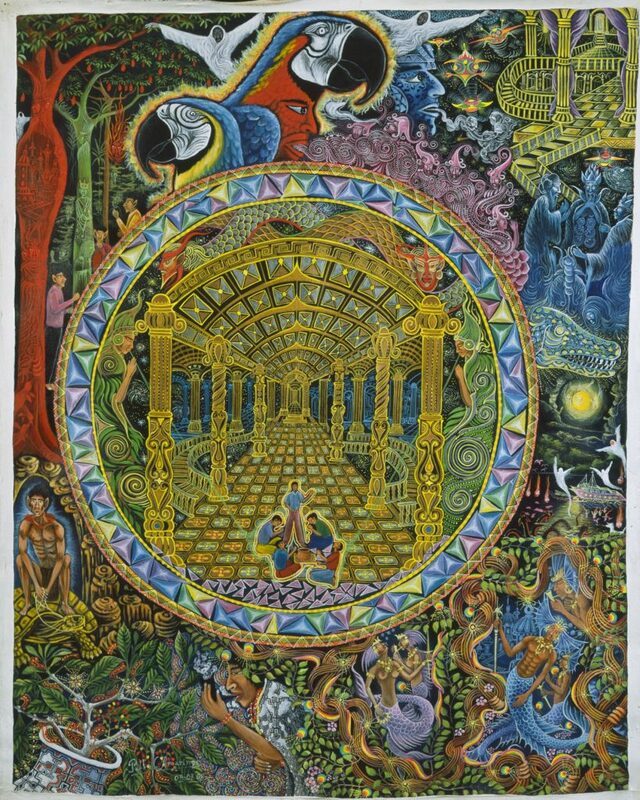 A depiction of ayahuasca visions. Therefore, DMT is also a breeding ground for strange ideas. One of the most popular misconceptions about the molecule regards the mysterious pineal gland in the center of the human brain. 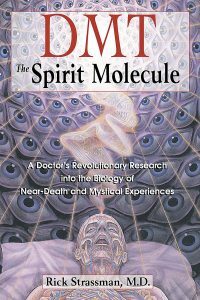 DMT does naturally occur in all human bodies (and in so many animals, plants and fungi) and it have been found in the pineal gland of the brain of rodents in very small amounts. But recent research has shown that DMT is not produced naturally in the pineal gland with anywhere near the amounts needed to create its incredible effects. We don’t know whether DMT is made in the pineal. I muster a lot of circumstantial evidence supporting a reason to look long and hard at the pineal, but we do not yet know. There are data suggesting urinary DMT rises in psychotic patients when their psychosis is worse. However, we don’t know whether DMT rises during dreams, meditation, near-death, death, birth or any other endogenous altered state. One interesting factoid about DMT is that its in so many different lifeforms on earth. It’s one of the most basic chemical elements of many lifeforms. For instance, common citrus trees, such as lemons and oranges, contain DMT. The reason why you don’t enter a kaleidoscopic time-space warp when drinking orange juice is because of an enzyme in your stomach that breaks-down DMT before it can get to your bloodstream. The powerful ayahuasca vine of the Amazon rainforest has a special molecule in it that enables the DMT to enter your blood. This means that orange farmers are literally mass producing one of the most powerful drugs on the planet. Researcher Morris Crowley estimates that the state of Florida (US) produces 5 kilos of pure DMT per season in its oranges. He explains that this is roughly 150,000 doses. Therefore, should we also call oranges drugs? While DMT is found all across the world, a scientist discovered how to create it in a laboratory in 1931. Richard Helmuth Fredrick Manske was first to synthesize it, but it was Dr. Stephen Szara of Hungary who showed the Western world that this molecule has powerful psychedelic effects. He was a standard scientist working in the 1950s and 60s and who visited San Francisco California in the 1960s. Szara went there to study the “hippies” taking DMT. 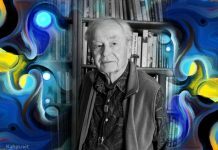 He wrote a fascinating if not strange article about his research called A Scientist Looks at the Hippies. You can read about it in Graham St. John’s fantastic book Mystery School in Hyperspace: A Cultural History of DMT. 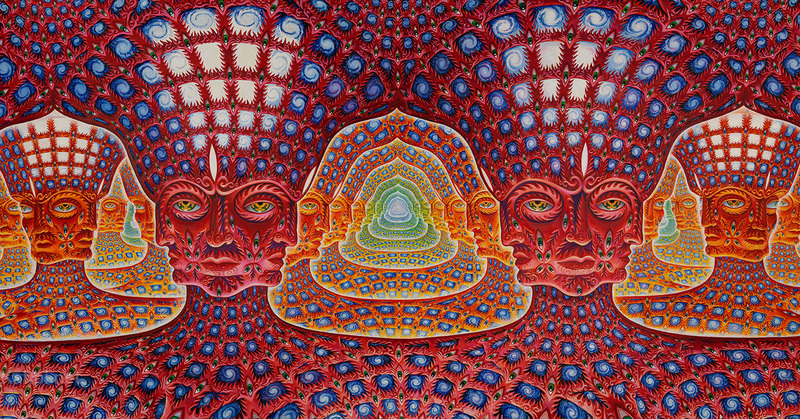 Header Artwork by Alex Grey.